CPUBalance uses proprietary technology found in Process Lasso to maintain system responsiveness during high loads, or even save you from a hard reset during a worst-case scenario. The ProBalance algorithm used in CPUBalance has been proven to retain system responsiveness during high CPU loads. While it can’t fix all responsiveness problems it has an impressive impact on a high CPU load, even on modern multi-core CPU’s. A 64-Bit operating system is required. CPUBalance is a subset of Process Lasso, a tool designed to manage and edit how your processes and services run. You can prevent running processes from hogging your CPU to improve the system's responsiveness. 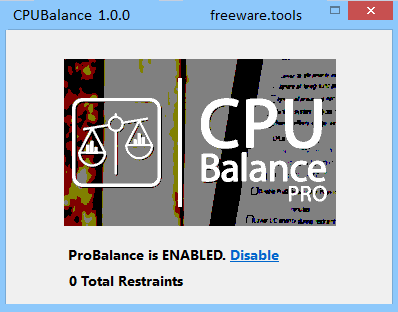 Made by the same guys who developed Process Lasso, CPUBalance is a lightweight tool that uses the company's ProBalance technology to monitor and prevent running processes from hogging the processor, in order to improve the system's response time. This application can be run standalone or along with Process Lasso, enhancing its existing ProBalance feature.